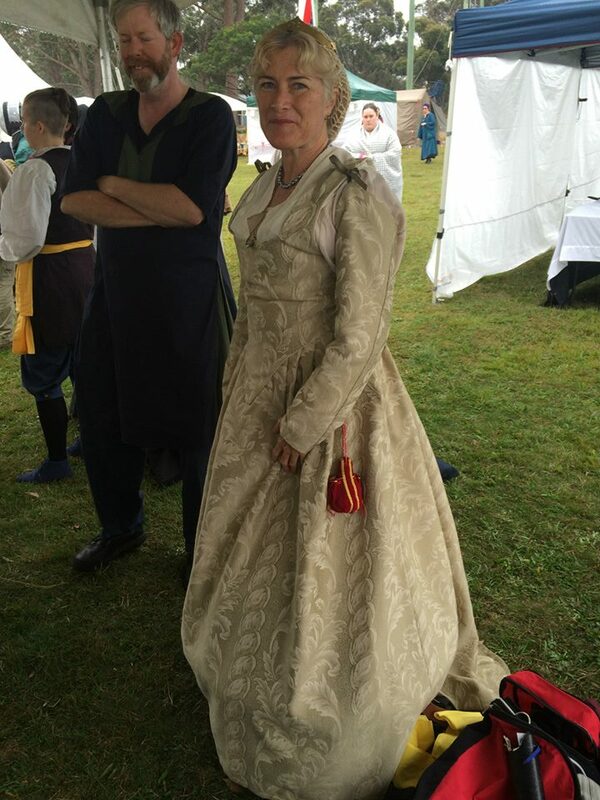 After noticing that Baroness Mistress Lindoret of Bryn Myrddin was fascinated by the lute-shaped purse I’d made Lady Amelot de Akeney, I decided to make a simpler version (given time constraints) to be ready in time for her White Scarf ceremony at Rowany Festival 2015. The finished product with strings and beads showing. Photo and work by Ceara Shionnach, 2015. As discussed in my documentation on Amelot’s purse, there were three primary sources that inspired this piece. Unlike Amelot’s purse, which is primarily based on a 16th c Italian painting of a highly embroidery version, Lindoret’s purse is based on an extant purse from the 16th century (either the Netherlands, or Italy) (Figure 1) and an extant purse from 16th century England (Figure 2). 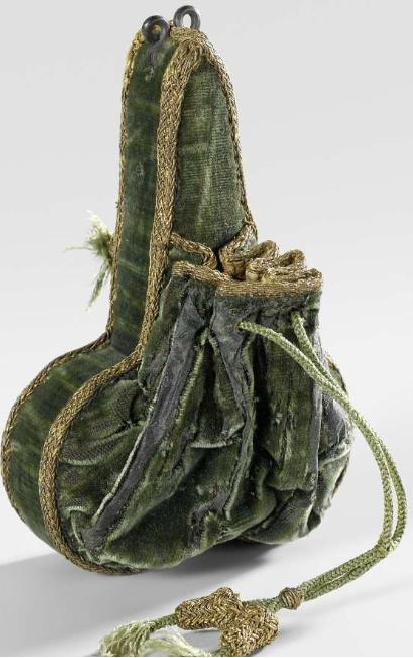 Figure 1: Purse, likely originated from Netherlands or Italy, c1591. 11cm x w7.5cm. Object Number BK-KOG-29. Rijksmuseum, accessed November 2014. Purse, England, c16th century. h12cm. Museum number 1878,1101.635. The British Museum, accessed November 2014. 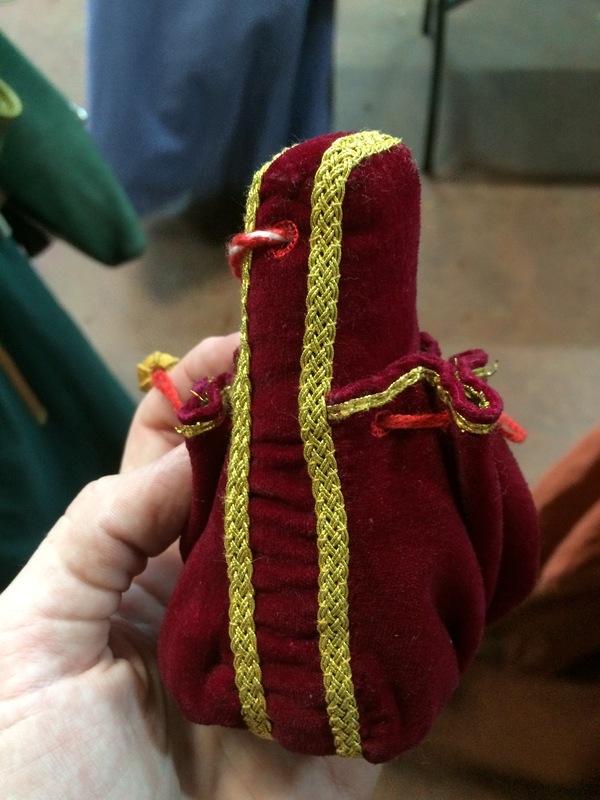 The bag shown in Figure 1 was found with three small coins in the pouch, and it is suggested that Figure 2 depicts an opulent gift from perhaps a love interest. It seems that they would have been mostly decorative rather than functional. I decided to start my pattern with the average height of the three extant pouches; approximately 12cm high. The base fabric is a red cotton velvet, similar to the fabric observed in Figure 2. I decided to make the purse with two pouches, one on each face, modeled on Figure 2. However, I used the same rough shape as Figure 1. I drew a shape that was approximately two thirds the height of the bag onto some calico, then elongated the shape approximately twice the original width. I cut this derived pattern out of velvet and a gold-and-green silk (for the lining), and whip stitched the two fabrics together. 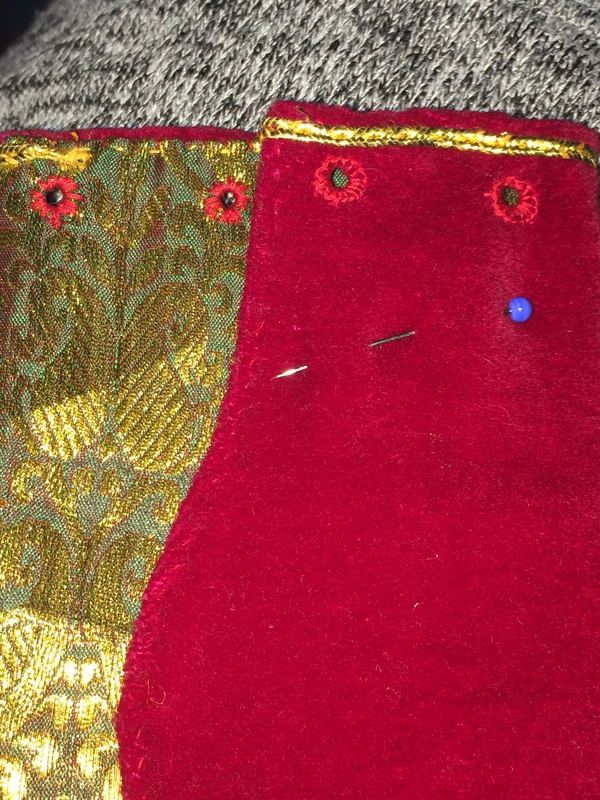 Next, I couched a line of a flat, gold cord along the tops of the pouches (Figure 1 also has gold cord along the top of the pouch), and made 6 eyelets in each. The two pouches front (top) and back (bottom) with gold couching and eyelets. Photo and work by Ceara Shionnach, 2015. A close up of the front and backs of the pouch pieces. Photo and work by Ceara Shionnach, 2015. Lastly for the pouches, I pleated in the bottom of each to make it fit the original bag pattern. The body of the purse was made of two lute-shaped pieces, and a long rectangle to join them together as the edging. 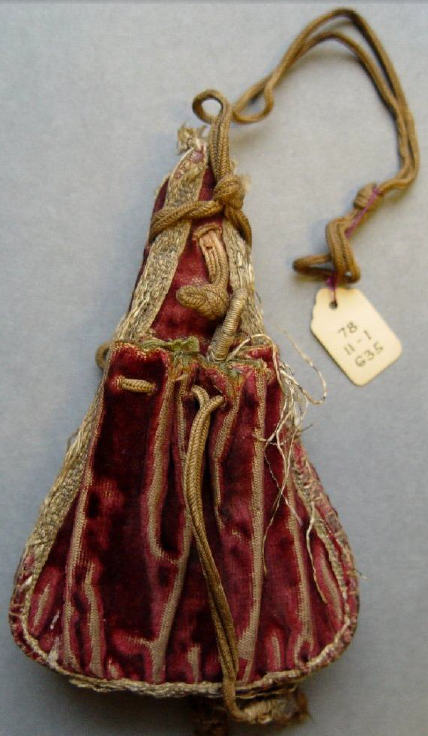 The British Museum lists that the large part of the red bag (Figure 2) is stuffed with horsehair. As such, I stuffed this bag with horsehair (and some unspun wool to make up the volume difference when I ran out of horse hair). 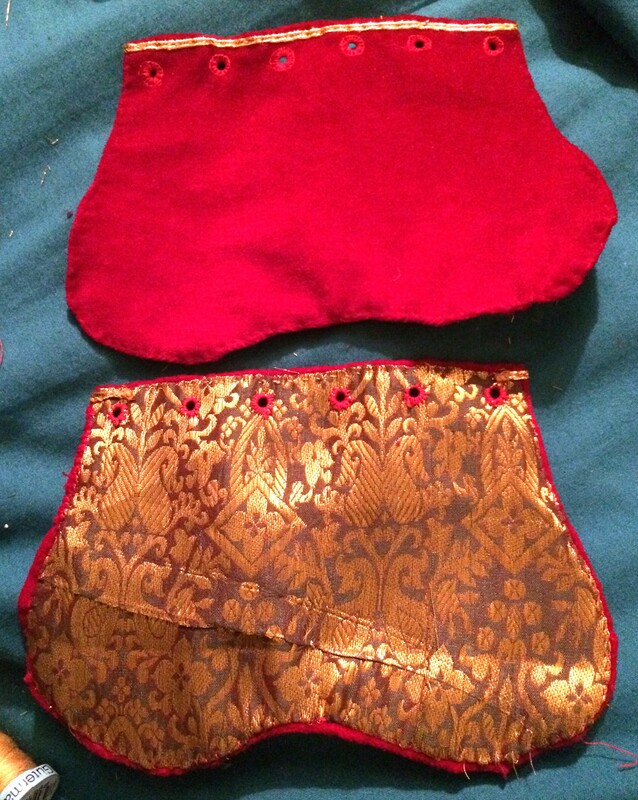 Next, I whip-stitched the pouches to the front and the back and couched gold braid along the seams. 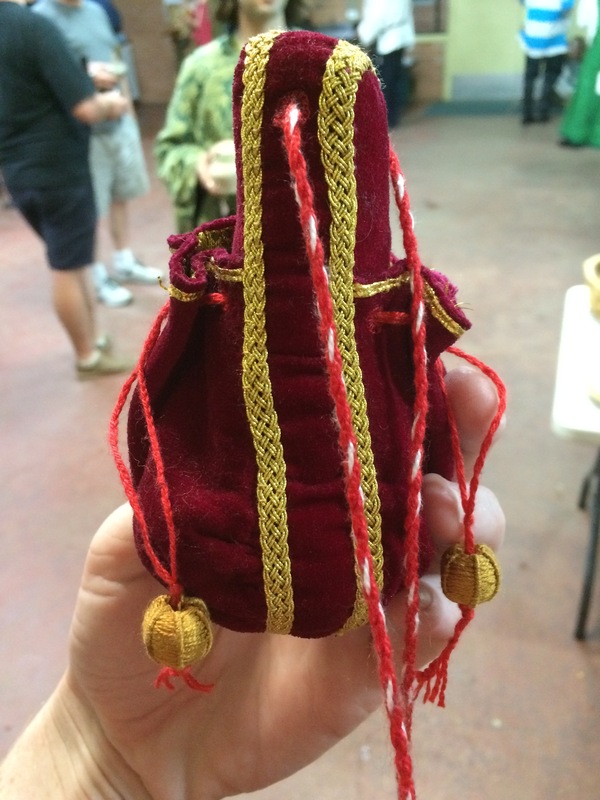 The pouches are attached and half of the gold braid is couched along the seams. Photo and work by Ceara Shionnach, 2015. 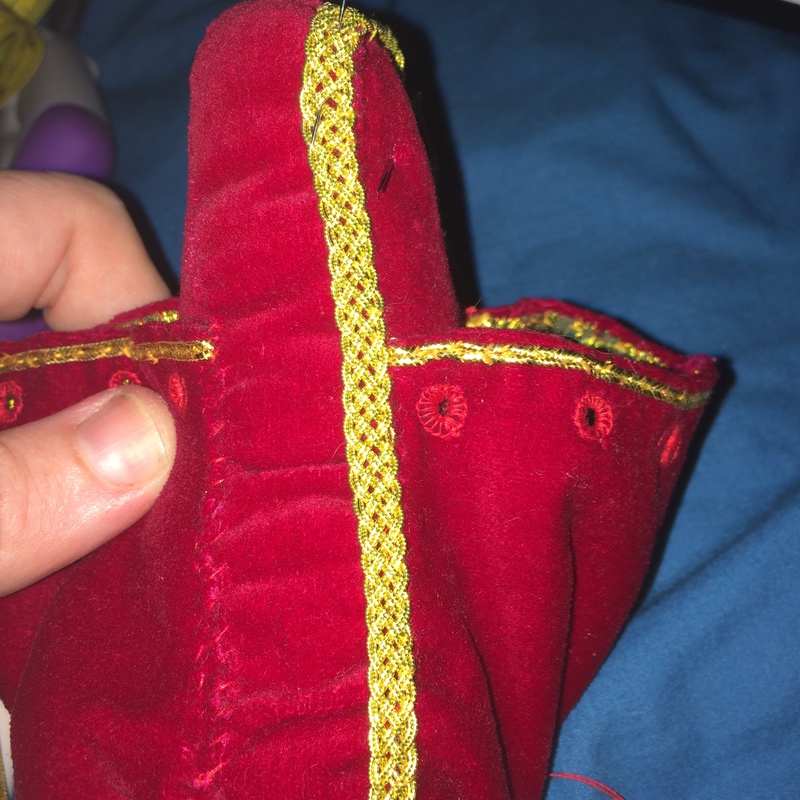 Two eyelet holes were stitched on each side for the drawstrings to feed through the middle of the stuffed body (there are two drawstrings that run in opposition). Two more eyelets were sewn up the top of the pouch – one on each side 0f the purse – so that a cord for hanging the bag could be run through the body of the purse. Finally, following the spined thread-wrapped bead technique (see my class notes on Thread Woven Buttons for more information), I added yellow decorated beads (silk wrapped around a wooden form) to the purse strings. The finished product. Photo and work by Ceara Shionnach, 2015. I finished the piece about half an hour before gifting it to Lindoret, which I did at her White Scarf vigil at Rowany Festival 2015. She seemed pleased with it, and it was certainly a crude talking point for the evening. I was massively chuffed to see her wearing it during her White Scarf ceremony, too – it contrasted wonderfully against her lovely golden dress. Lindoret, wearing her new red purse with her White Scarf ceremony outfit. Photo by Ceara Shionnach, April 2015.